The femtosecond cataract laser can treat low to moderate degrees of astigmatism. The outer layer of the eye can be divided into three areas: the cornea, the sclera and the limbus. 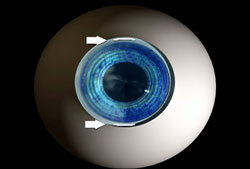 The cornea is the clear part, or the window, that covers the iris and the pupil. The sclera is the white part of the eye. The limbus is the thin area that connects the cornea and the sclera. Laser Astigmatism Treatment (LAT) involves making small relaxing incisions in the limbus, which allows the cornea to become more rounded when it heals. These precise and custom designed incisions are placed at the very edge of the cornea (in the limbus) across the steepest meridians. The procedure is usually performed in combination with laser cataract surgery. Currently, Dr. Slade and Dr. Walton use several types of IntraOcular Lenses (IOLs) which can provide a full range of vision – near, intermediate, and distance. However, if the patient has pre-existing astigmatism, he may perform LAT to further help in reducing or eliminating glasses or contact lenses after lens implantation. Another method of reducing or eliminating larger amounts of astigmatism when having cataract surgery would involve having a Toric IOL. Toric IOLs will help clear the distortions caused by astigmatism but Toric IOLs are monofocal lenses that can only provide clear vision at one point of focus, usually distance. PRK and LASIK can also treat astigmatism. Our doctors will make a recommendation as to the best method of correcting your pre-existing astigmatism. This is not LASIK eye surgery and if you are seeking LASIK please feel free to contact us. If you have questions about Laser Astigmatism Treatment (LAT), please do not ever hesitate to call our office at 713-626-5544 and speak to our experts.